Instead of having them as seperate programs would you prefer if what you can do in CD can be done in PD? It will drive up the cost I know but to me it seems better than having two seperate programs. Quote Mouhamad, use Rate Us & Provide Suggestions under PD's File menu to officially submit your request to the Cyber powers that be. As you know by now, this is a users group. Since you are a user of sapphire, you are in a better position to tell us ! I don't have sapphire, it's not available for PD but I know what it can do. It's just wishful thinking but I want Cyberlink to obtain a license or something. if the makers of Sapphire chose to give it to Cyberlink? I would really love to have it. Quote It's very easy, and this is a good example of how using keyframes in the PiP Designer is actually simpler than trying to do the same thing in the Crop/Pan/Zoom tool, because you have precise control over everything. You only need to set 4 keyframes: Add one for Position and one for Height/Width to lock the fulls screen values at the start of your zoom,. Then go to the location where you want to be zoomed in all the way, and set the H/W sliders to 6.0 (the max zoom). The last step is just to drag the frame's position so that your target eye is in the center (using an even numbered grid will help), and you're done! Here is the packed project so you can experiment with it directly. You can even import your clip from the media library and drag it on top of the existing clip, then choose replace. Your clip will now have these keyframe settings. I want to zoom in on something specific like into someone's eye and I want the zoom to target that area only so it looks like it's going straight into the eye. The crop and zoom tool isn't working for me because I can zoom but I have to adjust the position and that makes it look not smooth. Is there anything I can do? I imported two folders and I thought that PD would make folders for me but it just put all the videos in the media room. Can I organize them into folder? I recently bought an Insta360 One X 360 degree camera. Very nice piece of equipment. as an app, and, you guessed it PowerDirector17. Before I purchase PowerDirector I need to know 2 things though. 1) Will perpetual licenses fade out eventually? That would be a dealbreaker for me. I left Adobe due to a similar decision. Subscriptions are a real pain for small companies. i do not want to get into a situation in which I pay now for perpetual and than get forced into a subscription if I would want an upgrade to the next release later. 2) 4k and 5.7k resolution. The Insta360 One X can do 4K and even 5.7K video. If I purchase now PowerDirector 17 (not 365! ), will it be able to handle the 4K right away? Without work arounds & plug-ins? My PD17 Esssential (=Free version for trials) tells me I need an update for this. Can the Ultra Version do this? Or do I need Ultimate? Secondly will there be an update for the non subscription version so that it can handle 5.7k or more in the future? All within PD 17 (or the future 1 and without workarounds or extra plugins? Both of these questions are kind of essential as I have a big project coming up for which I need a proper 360 editor. Last not least, is there a way to add a feature to make a 360 panosphere still image rotate in a 360 (not 2D!!!) video? Similar to as if it was taken with a panohead. That would be way cool. Even better would be an option to add hotspots to have a user choose different videos as branch off. But thats perhaps asking to much. You can buy PD stand alone or get it as a subscription. The subscription gives you access to free stuff but they're not that good anyway. PD17 supports 4k but Im not sure about 5.7k. And as far as the 360 question. I know that you can edit 360 video but Im not sure about your specific question. Someone who knows more should respond to you. Thanks for clarifying what you're seeing. Many transitions do not have a Position button in their control panel, but whenever I use a transition that has one, clicking on it will always cause PD to crash. This also occurs if there are Start and End Position boxes ansd I click on either one. Cyberlink now has 4 crash reports from my testing, so be sure to post tthe CS number back here if you want to report this to CL tech support. I've downloaded and installed the trial version and the new content shows up in PD17's transition room. 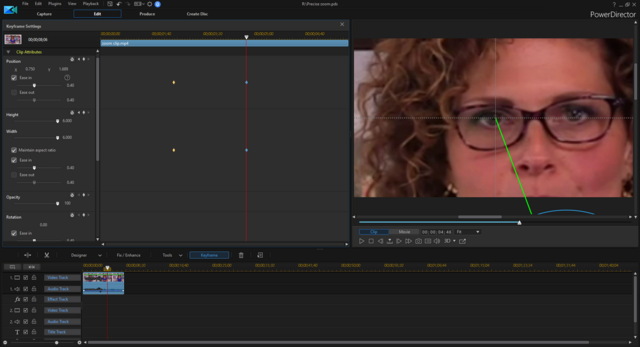 I placed several different transitions onto some timeline clips, then I dragged the endpoints, changed them from overlap to cross and back, and adjusted all the controls. did have one crash about a minute after I started playing with the controls, but I've spent another 5 since then and haven't had another one. One thing I noticed is that the right edges of the transition's number boxes in the right column are cut off, but I can't tell whose responsibility that is, Cyberlink or NBFX. Since it's not "officially" listed as working with PD on the NBFX web page, it may be hard to get them to help you solve the issue, although I think the price is significant enough that they would want to try. There are some really interesting transition FX in there, so if you want to keep trying it out I'd suggest checking your video driver and maybe changing the hardware acceleration settings in PD to see if that lets you run without crashing. You could also try uninstalling and reinstalling NBFX, and even PD. Before I troubleshoot I just want to confirm that when you clicked on Position it did not crash for you? Because I can mess with the sliders but when I click on position it crashes. Quote I've generally had very good response times from NewBlue, but to my knowledge the only packs that work with PD are these legacy FX. Stand-alone apps like Titler Pro should work, but I don't think the integrated packs will work if PD isn't specifically listed. You may want to look at Pixelan if you're looking for other transition options for PD. I have the last 4 packs shown here, and they are excellent. A person at NewBlue confirmed that it works yesterday. I have the trial and the transitions do show up in PD but the software crashshes if I try to adjust the position. I got a trial of NewBlue Transitions 5 ultimate. It works with PowerDirector even though it's not specifically stated on their website. I downloaded the trial just to see what it has to offer and when I click on the position button to modify a transition the program immediately crashes. I asked them but they are slow to get back to me so Im asking here. I would use the Motion tab in the PIP designer. Works great for still photos. You can set any path you want to make the photo move in just about any direction. You are limited by the size of the photo for how much you can move the photo within the frame. Here is a old tutorial on using Key Frames and PIP Motion. The basics still apply. I want to learn how to do a slow pan for a still video. Let's pretend you have a camera set up on a tripod and you want the screen to move and pan. Is there an effect that does it better than the crop/zoom tool?